Bayern Munich will offer fans a stunning new experience to watch the football match from a hotel suite after signing a multi-year partnership with Marriott International. The deal has seen Courtyard by Marriott become the official hotel partner for the Bundesliga champions and they will offer several once-in-a-lifetime football experiences to guests. 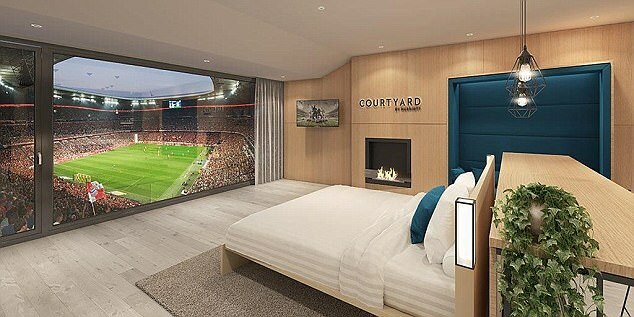 Fans will be able to stay in a modern, custom-built Courtyard by Marriott executive box at the Allianz Arena and watch the game from it. After the deal with Marriott international was announced the Bayern chairman, Karl-Heinz Rummenigge, said he was delighted the club will now be able to offer fans these experiences. 'We are delighted for two leading brands such as Courtyard by Marriott and FC Bayern to be entering into a long-term partnership. 'With Marriott International being the world's largest hotel chain and FC Bayern one of the world's most successful football clubs, I am convinced that this is a perfect match and very authentic partnership. The suite offers a breathtaking view of the pitch with guests also having access to a Courtyard bar which serves crafted cocktails and elevated menu options. Certainly beats sitting in the turnstiles. It has not yet been announced how much this match-day experience will cost and when fans can book it.